DELIGHT IN YOUR CHILDHOOD NOSTALGIA WITH US - Our wooden swing is the perfect choice to satisfy your inner playful self! Suitable for both average adults and kids, take a ride on our outdoor adult swings within your home or playground, and enjoy the surrounding outdoor breeze and carefree feeling of childhood! KEEP YOURSELF AND YOUR BELOVED SAFELY ENTERTAINED - PLEASE NOTE the max capacity and seat dimension if you're an adult. 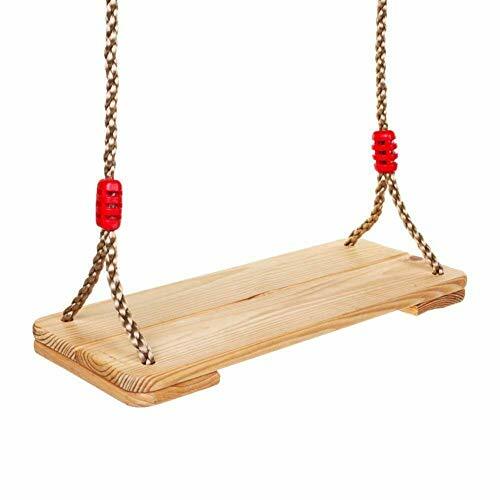 Made of the finest, eco-friendly natural pine wood and 7.5 ft max length nylon rope, wooden swing seat can withstand harsh weathers and tensions without breaking or instability. Holds up to 300 lbs and its 7.5x17.7x1.2" chair size is perfect and not slippery, so you and your kids can have no worries! YOU WOULDN'T BELIEVE HOW EASY THE INSTALLATION IS - No hardware tools required to install this wooden swing seat! First, choose the branches of a sturdy hardwood tree - oaks are ideal! Avoid fruit trees, evergreens, or trees that split easily. Then, tie the rope or the straps in the hanging kit around the tree branch and adjust to your desired angle, done! Instant fun! CUSTOM IT FOR PERSONAL TOUCH - You can paint this tree swing seat and put your kid's handprints on it! Don't be surprised when all the neighborhood kids swing on it when walking by. It can be used at anytime, especially the summer season where everything is all jolly, shiny and bright! GET READY FOR A SIMPLE-YET-SWEET ENTERTAINMENT! - You and your kids will be having such a blast, you would have wished you brought this years ago! Grab our swings sets now while our limited stocks still last. If you are, in any way, not happy with our tree swings for outside, feel free to return it within 30 days to get your FULL refund! 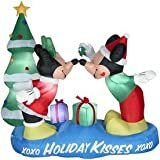 If you want good quality and authentic Fun Tree Swing (TM) products just like other satisfied customers, make sure you buy those ONLY From TODAY'S DEALS and Fulfilled By Amazon. Others are only selling our Copied Products! A tree swing is the definitive symbol of one's childhood nostalgia. Fret not as we are here to satisfy your inner child! Our classic outdoor swing has 17 x 7.5 x 1.5" seat suitable for adults and kids alike. The natural pine wood and ultra-strong 6.8-7.5 ft adjustable length nylon rope can withstand the harsh test of all weathers without breaking or instability. Moreover, it can hold up to 300 lbs, so let yourself go and enjoy! Easy to install without hardware tools! Choose the branches of a sturdy hardwood tree best for a tree swing, with oaks being ideal. Tie the rope around the tree branch and use a running bowline (or other slip knot) - voila! You will be transported back to the good old days of carefree games and summer breeze. So, what are you waiting for? If your problems are not swung away, feel free to return it with your hard-earned cash back within 30 days! Order now by clicking ADD TO CART button!